Budget is the name - beds are comfortable. Great for price and Rouen just a small drive away which is a beautiful city. Staff very friendly and locked car park. Just a short walk from the Zenith Arena. Very simple hotel, tiny bathroom, but all clean and the bed was very comfortable. Limited reception hours, but automatic check in is available outside this time. Safe parking. Several restaurants nearby - OK. Location was good. Choice of restaurants in the vicinity. Excellent for overnight stop. Easy to find. Rez de chaussée: we are handicapped. Simplicity of meal: accueil had improvised a simple, cheap and adequate evening meal since there were few diners on Sunday evening. Kettle in room. I liked having shower rather than bath. Perfect location for us, friendly reception at check-in and check-out, comfortable bed, in short all we needed. Great location an hour from Dieppe. Arrived late and the self checking in machinewas out of order but reception had stayed open. You do get what you pay for, this place is perfect for resting your head for a few hours but don't expect any frills! This hotel is located in the village of Saint-Etienne-du-Rouvray and offers free Wi-Fi internet access. The historic center of Rouen and the city's famous cathedral are just 3.2 mi away. All simply furnished rooms are air-conditioned and feature a TV. The private bathrooms are equipped with showers. 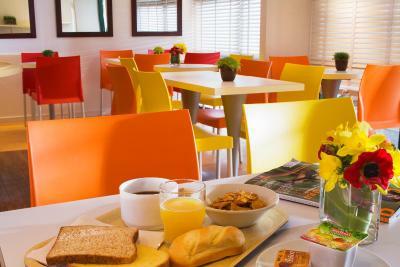 Breakfast is served every morning at Premiere Classe Rouen Sud-Parc Des Expositions. Free parking is available and the Rouen-Orléans Train Station is 2.9 mi away. The Aubette River is 3.1 mi from the hotel. When would you like to stay at Premiere Classe Rouen Sud - Parc Des Expositions? This air-conditioned room features a TV and private bathroom facilities. House Rules Premiere Classe Rouen Sud - Parc Des Expositions takes special requests – add in the next step! Premiere Classe Rouen Sud - Parc Des Expositions accepts these cards and reserves the right to temporarily hold an amount prior to arrival. Reception opening hours: 06.30 to 11:00 and 17:00 to 21:00 on weekdays and 07:00 to 11:00 and 17:00 to 21:00 on weekends and public holidays. If you expect to arrive outside those hours please check that you have brought the credit card used to make the reservation. When booking I requested a ground floor room as my husband is disabled and has great difficulty with stairs. I had an immediate confirmation that this would be available. When we arrived no ground floor room was available. Not good. There was no shampoo / soap. Annoying. The only negative for us is that there was no 'do not disturb' sign. The cleaner came in early in the morning both days, and the receptionist insisted that a workman came in to look at something. Nothing to do with Premier Classe, but it was impossible to get to Notre Dame de Rouen by car, though we did enjoy immensely the cathedral in Louviers. We would have appreciated suggestions for the best way to see Rouen centre attractions. Had problems with the automated booking in machine. Door did not lock properly, window did not shut ( security issue), no toilet paper, no remote for TV, all rooms had smelly toilets. Staff we informed of problems no action. The out side of the hotel looked almost derelict, the inside was not much better, shabby and in need of refurbishment. It felt like being in a prison cell with the smallest windows and a metal shutter we couldn't open. Toilet was stained and it wasn't very clean. Very old fashioned but value for money. the automatic check in ,parking difficult ( ended up parking in a disabled bay ). the door alarm kept activating . The room very cramped poor layout (banged head 3 or 4 times . Yes I know it is low budget but this is vey poor quality .